The Smoke Hollow 36 Inch Digital Electric Smoker with Window is a large capacity, 3 cubic foot cabinet smoker with a viewing window made of tempered glass. This can be the centerpiece of any backyard BBQ setup, guests will gather around this smoker to get a peek at what’s cooking. This is a sturdy, steel constructed 50-pound smoker. Not so heavy that you won’t be able to move it like some of those smoker vaults, but a well-built smoker you will enjoy using season after season and even on some holidays to smoke that turkey or ham shoulder. This sturdy electric smoker is everything you want for a backyard BBQ smoker. You’ll look like a professional with this digitally-controlled electronic 1500-watt electric heating element. The guesswork is gone when you use the temperature and time settings for ideal smoking time after time. You won’t have to wait for summer for great BBQ smoked flavor when you move this lightweight, yet sturdy smoker onto the patio for year-round smoked goodness. In addition, the smoke is locked in with the tempered glass window to view the meat while it smokes, so you don’t have to open the door to check on it and the neighbors won’t complain about the smoke. The four chrome-plated smoking trays allow for multiple adjustments up and down to make room on the shelves for large roasts or thin sliced jerky. Many jerky enthusiasts have confessed to buying additional trays beyond the four included with the smoker to get even more jerky and fish fillets into the smoker. Why buy expensive smoked salmon or Hickory cheese, when you can just smoke your own salmon, trout, and cheddar? Yet, the Smoke Hollow 36-inch smoker is big enough to smoke even a 15-pound turkey or ham shoulder with ease. With the ability to load various smoky flavor wood chips externally, you will not lose smoke or heat. This saves more smoke flavor for your pork, beef, poultry, fish, and wild game recipes. The wood chip tray allows you to add hickory, mesquite, apple, or cherry wood chips in a breeze while your meat continues to smoke. Additionally, the tempered glass viewing window allows you to check the progress without opening the door, another smoke and heat saver. The Smoke Hollow 36” Digital Electric Smoker with its tempered glass window in the front door makes it easy to view what’s cooking without opening the door. Your friends and neighbors will hover close to see what’s causing that amazing smell. 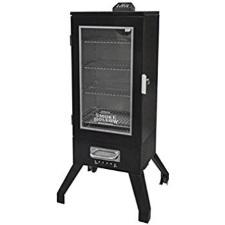 Jerky enthusiasts love this smoker, not only because they can see through the viewing window, though that is part of it, but because the digital electronic display allows them to set time and temperature for accurate recipes and smoke times that gives them the same taste every time without the guesswork. We found just 56 customer reviews for Amazon verified purchases. The average rating was 3.8 stars out a possible 5 stars. 65% of customers that bought the 36” Smoke Hollow from Amazon gave 4 or 5 stars, while those 296 of the 341 who purchased the same smoker from other retailers rated it either 4 or 5 stars. The overall rating from 341 customers for all retailers we could find rated it either good or superior and 87% were happy they bought it or would buy another. In summary, this Smoke Hollow 36-inch smoker with digital time and temperature display is very easy to use and is built to last. With its sturdy steel construction, you’ll get many years of use out of this smoker.